The Soviet model education system, which was adjusted to independent Ukraine, does not suit modern times. This is the claim that has long been voiced by teachers, parents, and school leavers. Even though it is the XXI century now, regarded as the era of digital technologies and information, just a few years ago educators were still focused working on old principles, students were sitting at desks that were made in 1930s, and paper lesson plans as well as school journals made up an inseparable part of the study system. Nevertheless, a few years ago it was decided to reform the education system in Ukraine. How are the changes progressing? And what results do we already have? What is Planned for Implementation? 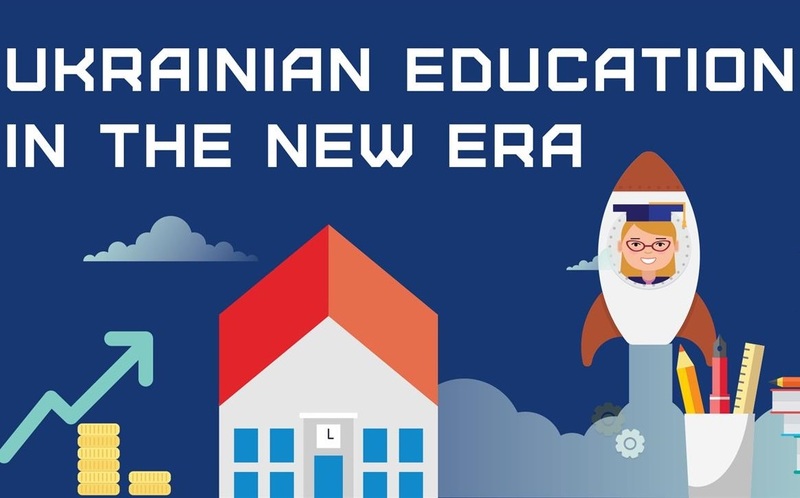 There are plans to transform the Ukrainian education system turned into an innovative environment, where school and university students acquire skills and abilities to obtain knowledge independently and apply it in practice. Such is the core idea of the reform. The reform involves introduction of new educational standards, improvement of the material and technical base, creation of a transparent system of funding of educational establishments, as well as increasing the prestige of the teacher's profession. New state standards of secondary, vocational, and higher education will be introduced based on the competency approach. "Competence does not merely refer to knowledge but also to the ability to use for one's individual and professional tasks," explains Liliia Hrynevych, the Ukrainian Minister of Education and Science. The new state standards of school education will help to introduce new teaching methods, change the format of communication between students, parents, and teachers, as well as implement project assignments and activity learning. By the time pupils leave school, they are expected to have other key competencies which, apart from the traditional ones, are initiative and innovativeness, economic competency, etc. Besides, a student will be expected to demonstrate other skills, such as critical and pattern thinking, creativity, as well as the ability to control emotions in a constructive way, evaluate risks, make decisions, and solve problems. A transparent system of school funding will be in place. Each educational institution will be required to disclose information about the budgetary receipts and their purpose. After the system has been introduced, parents will see how much money is spent by the state and on what things, and so they will be able to control the use of their contribution. According to the plan, reform of education is planned for introduction by 2029. The introduction of elements of the dual system of vocational education was started. The new Law of Ukraine On Education was adopted by the Verkhovna Rada of Ukraine on 5 September 2017. "This is the basic law, whose adoption unblocks opportunities for further reform of the education system and adoption of the Laws of Ukraine On General Secondary Education, On Vocational Training, and On Adult Education. Besides, members of parliament will be required to consider changes to the Law On Higher Education," Liliia Hrynevych, Ukraine's Minister of Education and Science, said in her comments. The Law introduces a three-tier system of secondary education: elementary education (4 years), basic education (5 years), and 'branch' education (3 years). All in all, the educational process at schools will last 12 years. A three-year senior school will be a lyceum of academic or vocational training. In vocational school, a student will master his/ her first profession, whereas in an academic lyceum he/she will deepen personal knowledge of specific subjects that will be studied further at a higher education establishment. Graduates of academic lyceums will be able to obtain a Bachelor's degree in three years (in most specialties) instead of four. "High school is undergoing the greatest change, as the main aim of establishing 12-year education is to reduce the workload per student and give him/her a chance to choose subjects and introduce a branch (specialist) high school," says Pavlo Khobzei, the Deputy Minister of Education and Science of Ukraine. The next step in the implementation of education reform will be the adoption of the Law On Full General Secondary Education. The bill is currently being presented for public discussion. According to the Law, "The education program of state or communal education institution cannot be implemented or provided (as a whole or in part) at the expense of parents and/or students." Students will be enrolled on the basis of annual assessment and final state examination. The draft law envisages a new approach towards the election, appointment, and dismissal of the school principal. The new Ukrainian school is, according to the plan, a place where a child would like to go with enthusiasm. There will be less theory but the knowledge will be absorbed in a more qualitative way due to the increase in practical assignments. On 21 February 2018, the Cabinet of Ministers of Ukraine approved a new state standard of elementary education, that will be implemented in all first grades from next year. "This document contains key elements – requirements towards compulsory learning outcomes and competencies of those who acquire education – that define the sense of education in the elementary school. Precisely what a child should know and what he or she should be good at after completing the first four years of study is stated here," says Liliia Hrynevych. The Minister of Education and Science has pinpointed that the new standard of elementary education involves raising children's respect towards intellectual property (which is about academic integrity). "Now we complain about problems with academic integrity in higher education. However, if we do not establish the basis in school for respecting intellectual property rights, it will not be possible to solve this problem in higher education. This standard has the overall result of learning that sounds like 'to follow the norms of legal interaction.' As such, after the second grade, a child is expected to determine the authorship of his/ her own works and demonstrate respect towards the works of others. After the fourth grade, respectively, a child is expected to observe the elementary rules of use of one's own works and the works of others," says Liliia Hrynevych. For the first time, reform has been supported by a significant financial resource from the very beginning – almost UAH 2 bln: UAH 998.7 mln for providing elementary school students with educational materials and mobile furniture, UAH 163.8 mln – for the purchase of technical equipment for elementary schools, UAH 386.5 mln – for improving the level of teachers qualifications, UAH 48.3 mln – for study materials in elementary school teaching and methodology, and UAH 272.3 mln – on textbooks for first-year schoolchildren. Changes will also include improving the social status of teachers. Last year, the Government raised teachers' salaries by 50%. This year, salaries have been increased by 25%. In 2017, the Ministry of Education selected 100 schools across the country (four schools per region) for the experimental introduction of the new standard of primary education, also with the purpose of getting feedback from teachers. One such school is educational institution № 143 in Dnipro. This is the only school in the city where students of two first grades started to learn under the new state standard of primary education even prior to its approval. Nataliia Lukina, the principal of the experimental school, says that the new standard of education envisages "child-centrism," in which the child, instead of a subject, is the top priority. "Here it is important for a teacher not to provide a lecture on the topic and then check how it was understood but to see the development and progress of each child," the school principal explains. In elementary school, the integrated course called "I Explore the World" has been added to the traditional subjects. It aims to expand elementary knowledge about subjects and phenomena, develop the ability to analyze, evaluate, systematize, and generalize. These qualities are needed in order to form critical thinking. New material is provided in thematic weeks: in all lessons during the week, teachers and students discuss the same topic. Experimental classes now have more group activities than they did before. "Each day, children meet in the classroom some 10-15 minutes before the lesson: they welcome each other and discuss the news of the day. And so friendship starts," says Svitlana Karpenko, the deputy principal of teaching and educational work at the elementary school. "On the whole, children in experimental classes have socialized more quickly. Why? Because they interact in a team. They work together. Besides, the teacher constantly changes groups and lets children switch their seats. They have an opportunity to communicate and help each other," says Viktoriia Lykhosherstna, the school psychologist. Teachers say that children are freer in experimental classrooms. They are taught how to speak their mind and not to be afraid to make mistakes. "There is no such thing as putting one's arms on the desk and just looking at the teacher. Here a child can stand up, lie on the carpet, take a rest, get up, and subsequently switch into the learning process," says the school principal, Nataliia Lukina. First-graders talk a great deal with teachers and parents – their works hang on classroom walls. Each classroom is provided with carpets and new materials, particularly Lego construction toys, which develop fine motor skills. Children have free access to the materials. Teachers have got more freedom too, but alongside this there is more responsibility. "It is hard to work in such classes. A teacher is a kind of director: to organize a lesson and play the role of an artist 'on stage' in front of children. It is not as easy as conducting a lesson from A to Z," says Lukina. According to the new state standard of education, teachers have to be innovators. For example, near 1-B classroom, the teacher has hung up an EQ semaphore, which refers to three emoticons of different colors that correspond to specific moods (happy, sad, so-so). A student is asked to put a clip on the emoticon that corresponds to his/her mood. In this way, a teacher can see which mood the schoolchildren have. "Children demonstrate their mood in this way. Having seen the clip with a student's surname on the red circle, the teacher may not give much homework," this is what Viktor Hromovyi, the chief of the Center for Testing Technologies and Education Quality Monitoring, says about the EQ semaphore. When asked whether she believes in the successful introduction of education reform, Nataliia Lukina says in response that everything depends on the workers in the localities and their enthusiasm. Written for The Reforms Guide and Ukraine World.